All forms of ceramic tile use some type of grout to fill and seal the seams between the tiles. Whether the tile is traditional ceramic, porcelain, or a quarry tile or natural stone, it is critical that the seams between the tiles be adequately filled with a material that prevents moisture from seeping down to the underlayment. To maintain this water-proof quality, all grout will need to be properly maintained—repaired when cracks form and periodically sealed to keep the grout truly waterproof. There are three main types of grout: cementitious grouts composed of a Portland cement base; epoxy grouts, and furan grouts, with variations available in each type. Cementitious and epoxy grouts are available in different colors that allow you to match or contrast with the color of tiles; furan grouts are usually available only in black. Cementitious grouts have as their main component Portland cement, plus filler particles of different sizes, a water-retentive additive, and colored pigments. Cementitious grouts are the traditional grouting material, used most often in residential applications as well as some commercial applications. Cementitious grouts come in a range of colors that let you match or contrast with the tile. This grout is mixed with water and applied with a trowel. The water retentive agent in cementitious grouts retards the drying time, allowing the cement to slowly cure for maximum hardness. When used with porous tiles such as quarry, slate, or other natural stone tiles, cementitious grout can stain the surfaces. Most professionals seal porous tiles before grouting—a step that is not necessary with standard glazed tiles. Sanded cementitious grouts include fairly large sand particles that can be seen and felt—they look and feel gritty. 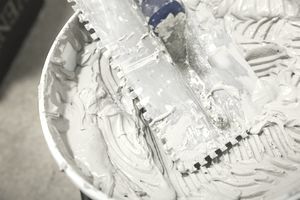 Sanded grout is normally recommended when the grout seams are 1/8 inch wide or more, as the sand provides extra bonding power that prevents cracking. Some care is required if using sanded grouts on highly polished tiles, as the sand can actually scratch the surfaces. Testing the grout on sample tile is a good idea. Unsanded grouts have a much smoother texture, since the mineral particles they contain are very fine powders that have no noticeable grit. They are used with grout seams that are 1/16 to 1/8 inch wide. When used with with wider seams, unsanded grouts have a tendency to crack because they lack the binding power offered by sanded grouts. Sanded grouts may be formulated with a latex polymer additive, either included in the dry mix or added in as the grout is mixed with water. The additive enhances the water-proof nature of the grout, and also increases strength. Cementitious grouts are by far the most popular and can be used virtually everywhere that tile is installed. However, even grouts containing latex additives are somewhat porous and subject to staining. All cementitious grouts need to be sealed with a penetrating sealer every year or two to keep them stain-free and fully waterproof. Epoxy grouts are an entirely different form, using no Portland cement. Neither is water used in the mixing process. These grouts consist of epoxy resin, silica fillers, pigments, and a hardener. Epoxy grouts are considerably less porous than cementitious grouts and are a good choice in places where acids and greases are present—such as in kitchens. Epoxy grouts come in both unsanded and sanded forms, although the type of sand used is different from that found in cementitious grouts. Epoxy grouts set up fairly fast, making them a little tricky for amateurs. Epoxy grouts are also much more expensive, costing about $8 per pound vs. $1 to $2 for cementitious grouts. But for areas where maximum stain resistance is required, epoxy grout may be an excellent choice. Be aware that epoxy grout can badly stain tile surfaces that are porous and unglazed, such as limestone or quarry tiles. If using epoxy grout on these tiles, the tiles should be sealed before grouting. One advantage of epoxy grouts is that they don't need to be sealed, as do cementitious grouts. However, they can become stained. Scrubbing with a mixture of bleach and water, or vinegar and water, usually does a good job of cleaning epoxy grouts. Another type of hybrid grout is also available, which is essentially an epoxy grout enhanced with Portland cement. The characteristics of this grout are similar to standard Portland cement grouts—they require regular sealing, etc. However, the grouts are harder, stronger, and are more stain-resistant than standard cementitious grouts. Furan grout is similar to epoxy, but it is made of polymers of fortified alcohols that are highly chemical-resistant. The name derives from the fufuryl alcohol included in the formula. There is no water at all used in this type of grout. Furans are two-component systems that contain a furan resin and a filler powder with an acid catalyst. It is the acid catalyst that causes the furan resins to cure, forming a thermosetting resin that has unsurpassed chemical-, physical-, and thermal-resistance. Furan grout is commonly used to grout brick pavers and quarry tile and it is also recommended in areas exposed to chemicals and grease. The tile surfaces may be smooth, non-skid, or abrasive, depending on the intended use for the floor. The tile or brick surfaces must receive a wax coating to protect them from staining prior to the installation of furan. Because of the difficulty of installation, these grouts are normally used for industrial projects, such as laboratories, dairies, and meat-packing plants. Precautions should be made when mixing to avoid breathing the vapors. Special skills are required for proper installation, which must be done when and should be used when temperatures are between 60 degrees and 90 degrees Fahrenheit (70 to 80 degrees is ideal). Cost depends on the level of expertise of the contractor and the area on which the tile grout will be installed. As an average, it is safe to say that the cost can range between $3 to $5 per square foot for grouting, cleanup, and sealing (where required).